Mayor Muriel ​Bowser came to Capitol Hill this morning to announce the launch of a Robbery Intervention Task Force to target what she characterized as robbery sprees occurring at the hands of a small group of repeat offenders who target ​certain areas and commit crimes in quick succession. The heart of the new Task Force is increased cooperation and coordination between and among the​ MPD, the Metropolitan Transit Police, the Office of the DC Attorney General, and the US Attorney’s office. The effort will allow sharing of information among public safety agencies in real time, utilizing special crime analysts to spot problems and sharing that information along with video from CCTV and Metro cameras as well as street intelligence from sources among public safety agencies. For its part, the US Attorney’s Office will assign senior prosecutors to aggressively prosecute robberies, prioritize violent crime, make special efforts to coordinate evidence, and seek pre-trial detention to keep repeat offenders off the streets. ​ The prosecution rates of suspects accused of committing crimes on Capitol Hill – and elsewhere in the city – has been the subject of concern and discussion in the neighborhood, and ANC 6B Commissioner Denise Krepp was on hand at today’s conference to ask whether the US Attorney’s office felt the $2,000 raised from the community was sufficient to cover the cost of a FOIA she filed in order to ascertain those statistics, or whether to community would have to “bake more FOIA cakes.” The US Attorney demurred, saying he was preoccupied with prosecution and others in his office dealt with gathering the material requested by Krepp. The Mayor responded to Krepp by noting a District study is underway to collect some of the same data. 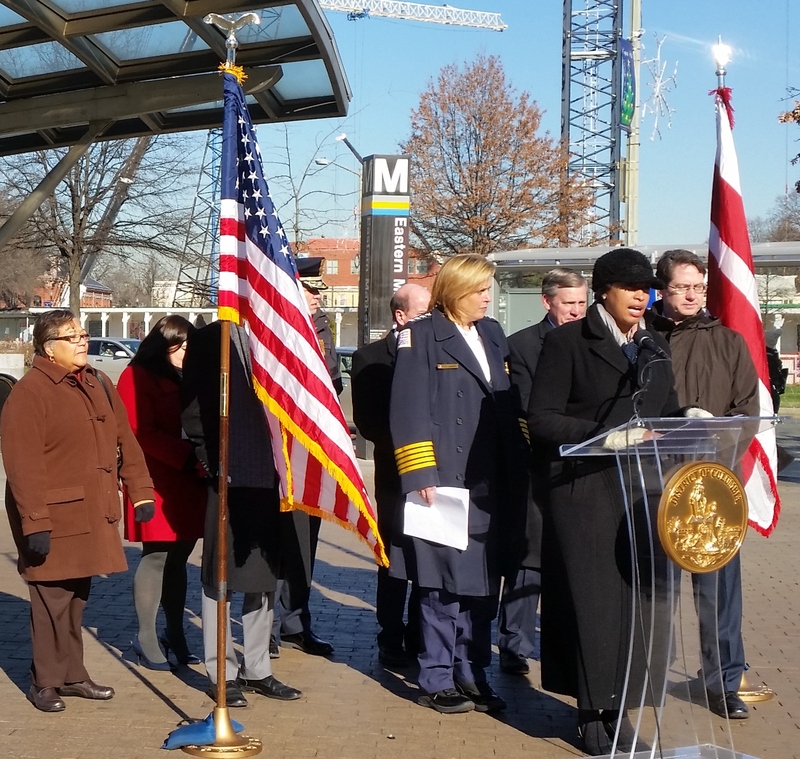 In her prepared remarks,​ Bowser deplored a recent assault on the Red Line near NOMA Metro stop and said she would not tolerate a lack of public safety on the Metropolitan Transit System. MPD has video of the perpetrators in that case and she urged residents to view the video and help identify the suspects. MPD Chief Lanier spoke to the need for the Task Force, citing the small number of individuals responsible for a large number of crimes – “a small group of individuals might be responsible for four or five or six robberies in a single night. The goal will be to make sure that one robbery doesn’t become more.” Lanier said the new coordinated effort has been in operation since December 11 and listed multiple arrests which have occurred since then to demonstrate its success. Also in attendance at the news conference were Councilmembers Charles Allen and Anita Bonds, DC Attorney General Carl Racine, US Attorney representative Richard Tischner, and MTP Chief Ronald Pavlik. I wonder if this is the news conference they were attended when this news crew was robbed? Perhaps the ABC7 news crew can do a piece about how one should not leave valuables visible in a car.